I made some salad dressing on the weekend. 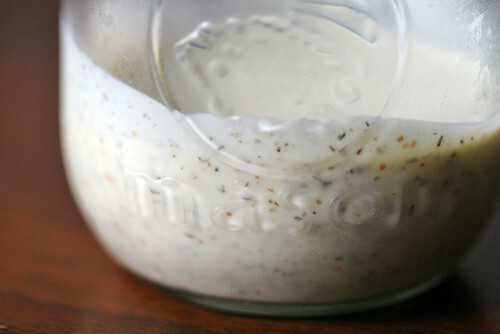 It's made of yogurt, lemon juice, dijon mustard, honey, salt, pepper, chives, dill, garlic and red pepper flakes... basically I just kept throwing ingredients in until it tasted salad dressing-y. 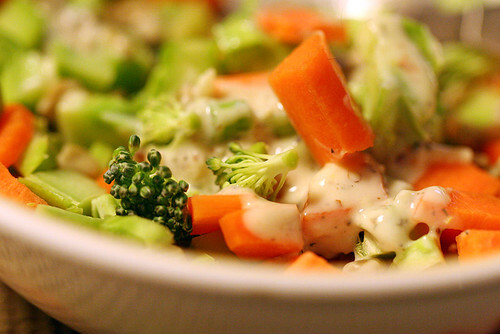 Tonight I ate some with a bowl of carrots, broccoli and sunflower seeds. 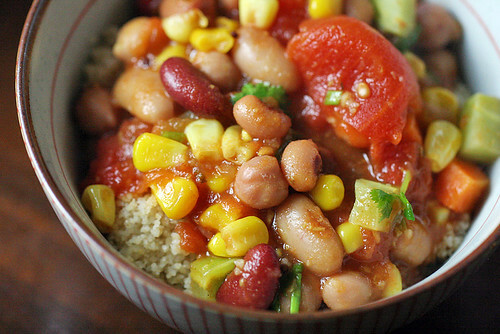 The eating out of my pantry continues with couscous, broccoli, carrots, corn, a can of mixed beans, half a can of whole tomatoes and more of that Madras cooking sauce. And cilantro and chives. And a little Parmesan cheese. Surprisingly edible. I'm still avoiding a bag of Trader Joe's Harvest Grains that I've owned for a couple years now... but its days are numbered. I also made some blueberry chocolate chip granola bars. They taste great, but I overbaked them a bit and almost broke my knife in half trying to unstick them from the baking dish. Reviewing the recipe it's based on, I blame this on forgetting to add 2 Tbsp butter, and using 100 mL less condensed milk. In any case. Here's tonight's version of the recipe. It makes 16 bars. I don't think it needs the butter, so I'd just suggest baking for less time. 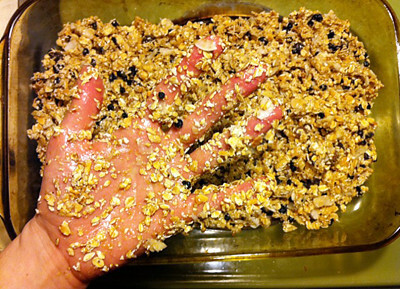 Toast oats on a baking sheet for 10-15 minutes, stirring often. Pour into a large bowl and let cool to room temperature. Stir condensed milk, coconut, almonds, wheat germ, chocolate chips and blueberries into the bowl until well blended. You will likely have to use your hands, and it will likely be very messy. Press mixture flat into a 9x13-inch baking dish. Bake for anywhere between 10 and 20 minutes, depending on how crunchy you want them. 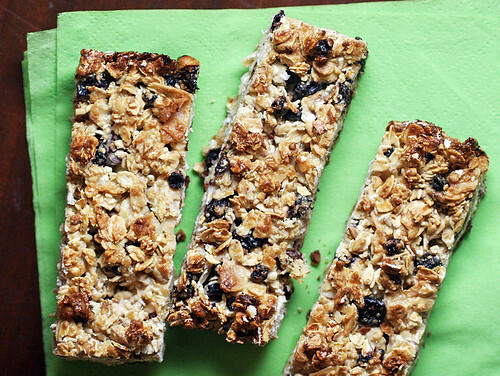 Lightly browned just around the edges should give you moist, chewy bars. Let cool for 5 minutes, then cut into bars. Sooo it was a really busy night. 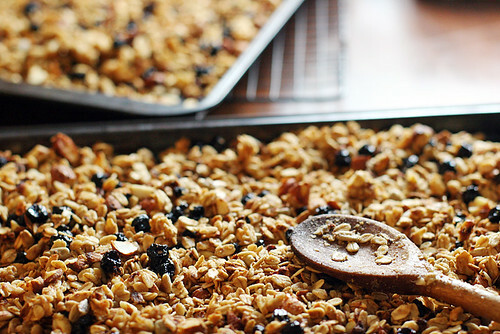 I ALSO made blueberry granola. This recipe, with blueberries instead of cranberries. (I recently bought a giant bag of dried blueberries on sale, so everything will be blueberry-themed for a while.) Ok, I'm officially stocked up on granola-related items.